Dad’s big day is coming up (Father’s Day is Sunday, June 21) and we love the idea of making a card with a personal touch. 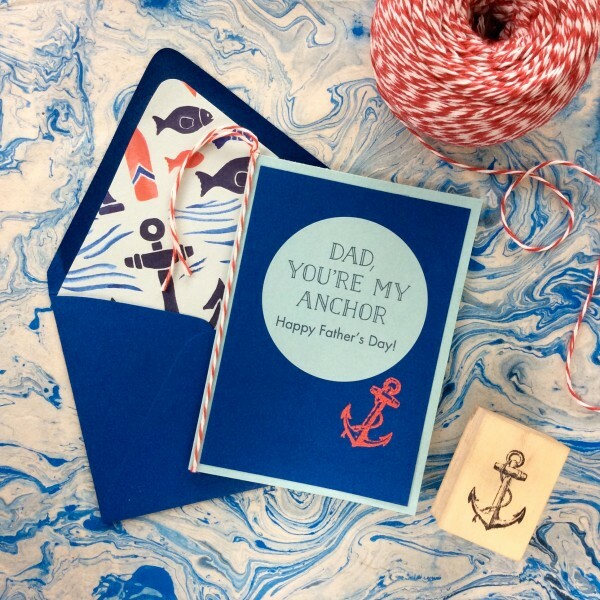 This nautical-themed greeting is the perfect idea for a dad that loves the water. Stop by a store near you to get these supplies in time! Download this free label template and print it on the circle labels. Adhere the Royal Blue paper to the 4 bar folded card with double-sided tape or a tape runner. Stick the circle label to the front of the assembled card. Stamp the Anchor stamp with Versamark or red ink. Coat the anchor with red embossing powder and heat set (watch our embossing video here). Tie Baker’s Twine around the spine of the card. Line the envelope with the Anchors and Waves gift wrap (watch our envelope lining video here).